Don’t just get a haircut, get a stylish look from a gorgeous hair stylist at Hair Mechanix. Hair Mechanix has several locations in the greater metro Detroit area of southeast Michigan. These are not your grandfather’s barber shop. These are places designed by men for men. A relaxed and fun atmosphere where you are treated to a great new look by great looking female hair stylist. A place where you can come in and if there is a short wait, you can relax with a complimentary beverage on stuffed leather couches while sitting back and listening to some tunes over our impressive sound system or by watching the latest game on a flat screen. When it is time for your look to be revitalized, it will be with a great looking female hair stylist. No, not your grandmother’s beautician, but, a men’s hair stylist. A woman who knows how to make you look the most appealing you can be. You makeover type of treatment could include a shampoo along with a brand new hair style or you can stick with your tried and true current style with just a few touchups to help you keep looking your best. During your styling session, you can talk sports with a woman who understands what you’re saying. You can watch your favorite game or race or whatever you want on the smaller flat screen immediately in front of you. All the while being pampered by some great eye candy. At Hair Mechanix, it is our mission to not only get you looking your best but, to help keep you looking your best too. It is our mission to accomplish this in a setting that is relaxed and fun filled. A place that you can consider a harbor or refuge from the rest of the world and not like the Saturday morning visit to the local barber where you waited for some scruffy old guy with hairy arms on some hard and uncomfortable chair in a place with no appeal. All of this just to get up on the chair and hear him say to your dad, “same as the usual dad?” To which your dad would reply “yeah, you know what to do”. Now, you can get a great hair style in a pleasant atmosphere. A place where you will want to go, because you know you will come out looking great. You will be feeling better for the time you spent with your stylist while she pampers you. Also, she held a great conversation or simply let you relax and unwind. Stop by the Hair Mechanix nearest you in metro Detroit. 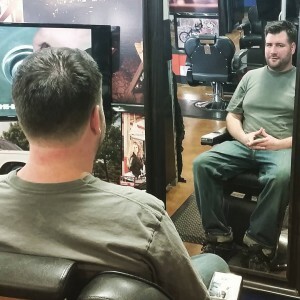 See for yourself how different a hair cut can be with us!